In my interview with Shel Israel back in 2010, we discussed how Twitter would monetize its growing popularity. The segment was aptly titled Can Twitter Make Money. For those who are unfamiliar with Israel, he is one of the country’s foremost authorities on social media, having co-authored the book Naked Conversations, How Blogs are Changing the Way Businesses Talk with Customers with Robert Scoble. Scoble of course is also a notable presence (and force) in the social media world. Israel also wrote Twitterville: How Businesses Can Thrive in the New Global Neighborhoods. During the discussion, Israel talked about the fact that in the then emerging social media world, the monetization of platforms such as Twitter would not occur through it’s users, but through sponsorships. You can listen to the applicable excerpt of my interview with Israel below. In the context of my recent posts including The absence of a “free press”: Is this why procurement industry coverage is so poor?, Israel’s comments raise an interesting question. If the user (or reader or listener) is not the one footing the bill in terms of supporting a medium such as a blog, then who is? Similar to the implications of the credit card commercial’s admonishing question “what’s in your wallet,” the possible answer or answers are fraught with conflicting interests. The problems related to conflicts arising from the influence of a medium’s revenue source, is that it can potentially undermine the market’s ability to discern between credible information and paid hype. 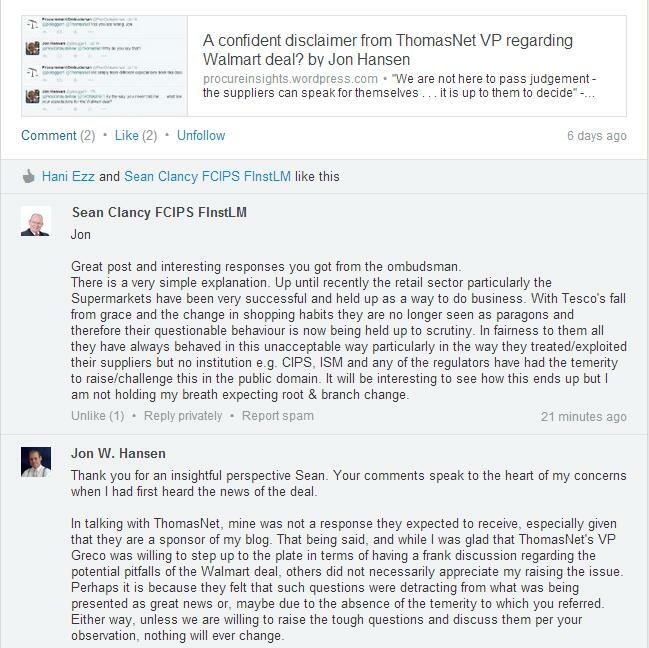 This point was illustrated in a recent comment exchange I had with a reader on LinkedIn regarding my July 22nd post A confident disclaimer from ThomasNet VP regarding Walmart deal? While I was obviously pleased that Procurement Insights was the only one to bring this, as well as other stories of importance, to the public’s attention, it was also somewhat troubling for the reasons highlighted in my response. This raises the question . . . why, as many have suggested, is Procurement Insights willing to go where few if any go in terms of covering the tough stories? While this blog has sponsors, the price range to become one is $250 to $1,000 per year. With 24 in total, it works out to being a very small percentage of my overall revenue. Nor does sponsorship include a promise of favorable or watered down coverage, as demonstrated by the ThomasNet story above, or my assessment of Elcom (as a former sponsor, I guess everyone isn’t going to be a fan of such an approach). So from where is the majority of my revenue derived? Speaking engagements and ghost writing. With speaking engagements, I am not paid to seek consensus or gain audience approval relative to having to bend the news to suit their agenda. What audiences want is factual, well researched insights that will inform and empower them. From a ghost writing perspective, while there are a couple of procurement-related clients, the majority are from other industries such as dental, financial and, more generally, the FP500 executive world. In short, I cover the procurement world because I have both a background and a passion for it, as opposed to relying on the industry for a livelihood. Interestingly enough, it is my interaction with those from other sectors that has given me a greater insight into our profession, and a corresponding objectivity. At the end of the day, and as discussed with Shel Israel and lampooned by John Oliver, someone does have to foot the bill for supporting the various platforms and media outlets through which you obtain your news and market intelligence. The question isn’t one of why, but who? Who pays for analyst firms such as Gartner or blogs such as Spend Matters? Who picks up the tab for associations such as the NIGP? It is in knowing the answer to this question, that you will ultimately be able to truly assess the veracity and value of their insights. Editor’s Note: Do you know the answer to this question?